Cleanse. Tone. Scrub. Masque. Yes, 4-in-1. 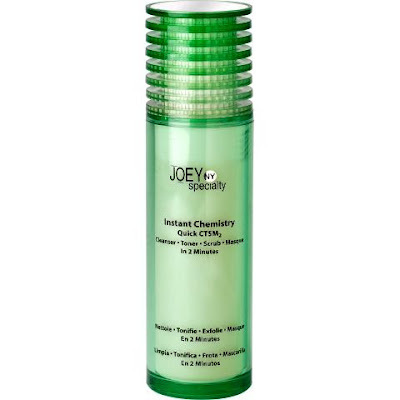 Joey New York CTSM2 in Anti-Aging or Hydrating formulas ($30, each). Oily skin (green bottle). Dry skin (blue bottle). Marine Collagen for plumping and Prozymex HBT for anti-aging benefits, as well as Papain enzyme that works quickly to scrub, exfoliate, and smooth your face. Nothing complicated with this Joey New York beauty item. Simply wet face and apply the gel formula. It will thoroughly cleanse your skin by removing dirt & debris. You will feel this product working because a mild cooling effect will begin to happen which will tone and clarify your skin. Massage or scrub this highly effective formulation in with water for about 1 minute, leave on for another minute, and watch it foam up into a masque! And then rinse off and dry. Your skin will feel so smooth and clean. Trust us. This is a very unique experience in washing your face. You can find Joey New York skin care products online at many beauty sites, including: http://www.discount.makeup.com/ and http://www.folica.com/.